Health and safety challenges associated with manual sanding include vibration exposure, awkward postures, and high grip forces. 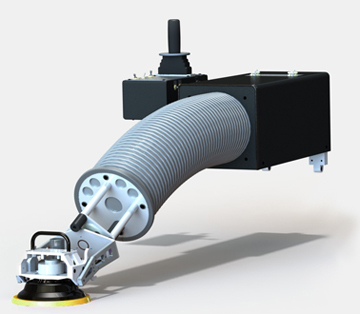 The EMMA Arm absorbs all vibration generated by the sander(s), and allows the operator to manipulate the End-Effector from a comfortable seated or standing position via joystick controls. By lowering the operator injury rate (thus lowering costs of treatment and recovery), EMMA mitigates costs associated with drops in productivity due to operator turnover, impact on morale, and new operator training. Lastly, EMMA allows for the opportunity for persons on light duty to continue performing surface preparation. Health & Safety Brochure click here.